The holidays are upon us (where did the year go?! 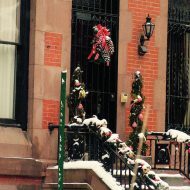 ), and New York’s most popular shopping spots will soon be flooded by locals and tourists alike. No matter who you’re shopping for, NYC is the ultimate destination when it comes to finding the perfect gift for everyone on your “Nice List” – including yourself. In case you need some help deciding where to shop during the Christmas rush, here’s our handy New York holiday shopping guide. One of the best things about being in NYC during the holidays is shopping the pop-up holiday markets. 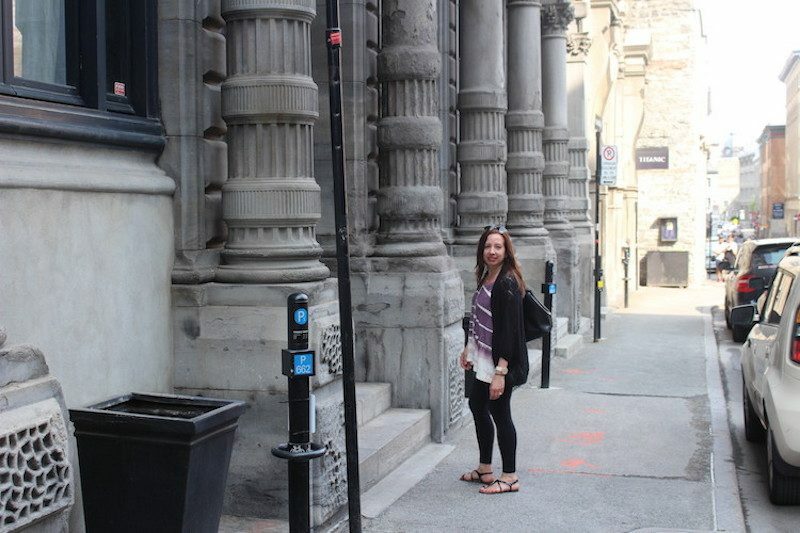 These temporary spots are a great way to find unique gifts that you won’t find elsewhere. 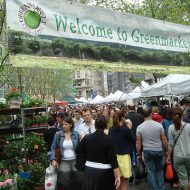 Bryant Park is a local favorite, as it features food and products from nearly 200 vendors and has the ambiance of a European holiday village. The market will be open this year from October 27 to January 2, and you can experience a quintessential “Hallmark moment” by taking a spin around the park’s 17,000-square-foot outdoor ice skating rink. 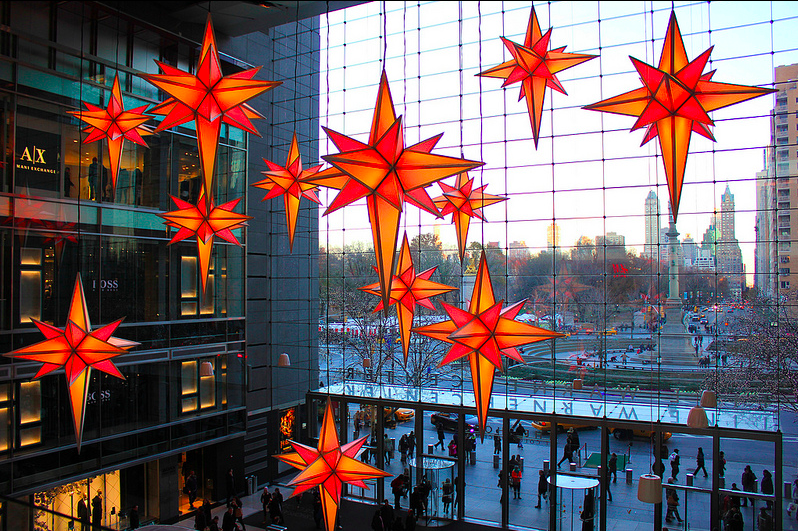 At the Columbus Circle Holiday Market, you’ll feel as if you’ve stepped into Santa’s workshop. This year, the market opens November 28 and closes December 24. During that time, you can shop stalls of clothing, accessories, jewelry, home goods, and artwork. Love Pop greeting cards will also be making an appearance for the first time. 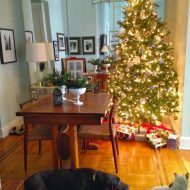 The Union Square Holiday Market is another NYC icon, highlighting incredible products from talented vendors around the world – think handmade soaps, embroidered goods from Haiti, and whimsical canine accessories. Stop by any time between November 15 and December 24 for a festive shopping spree. If you’re not a fan of the chill of open-air markets, then head to Grand Central Terminal from November 12 to December 24 to browse the Grand Central Holiday Fair. This indoor market is a beloved New York City tradition and promotes American-made and handmade goods including artwork, clothing, and home accessories that are locally sourced and socially conscious. Just below Central Park, there’s a stretch of ten-plus blocks on Fifth Avenue that’s peppered with top designer boutiques and chain stores. Set your credit card on fire at Cartier; shop for your favorite technology fan at the Apple store; or purchase some new wardrobe classics at Ann Taylor. The Tiffany & Co. flagship store is always a beautiful place to visit (check out the café if you haven’t already); or, pick up a shiny new bauble at Harry Winston. Feeling extra generous? A gift from Louis Vuitton, Gucci, or Fendi is bound to put a smile on anyone’s face. Every holiday shopping guide for NYC should include the city’s classic department stores. 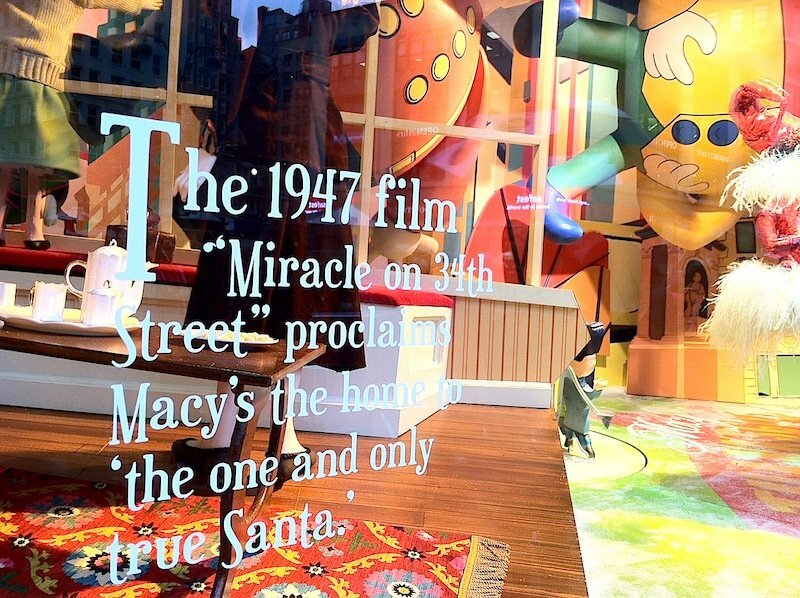 Macy’s flagship store at Herald Square is where everyone loves to pay homage to Miracle on 34th Street, and Bloomingdale’s is always a trusty standby when searching for the right present. 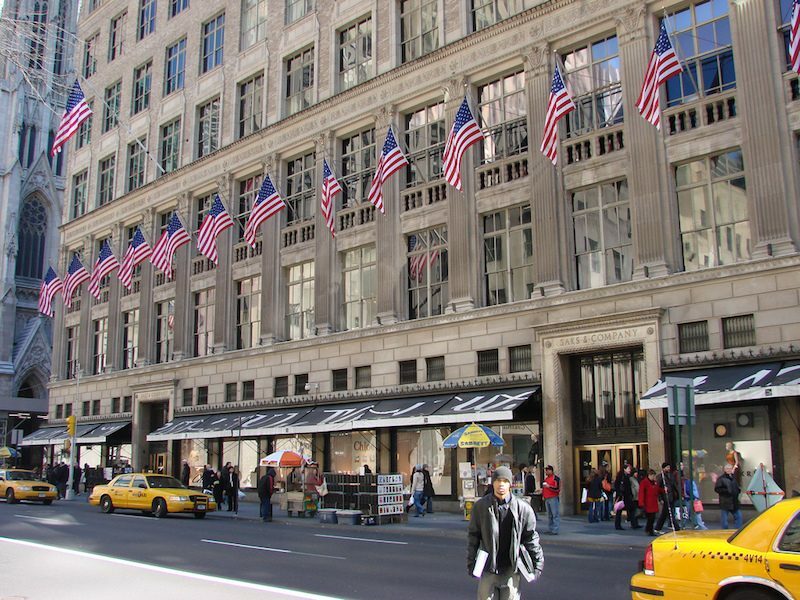 Saks Fifth Avenue and Barneys are both ideal for shopping for designer and luxury goodies. 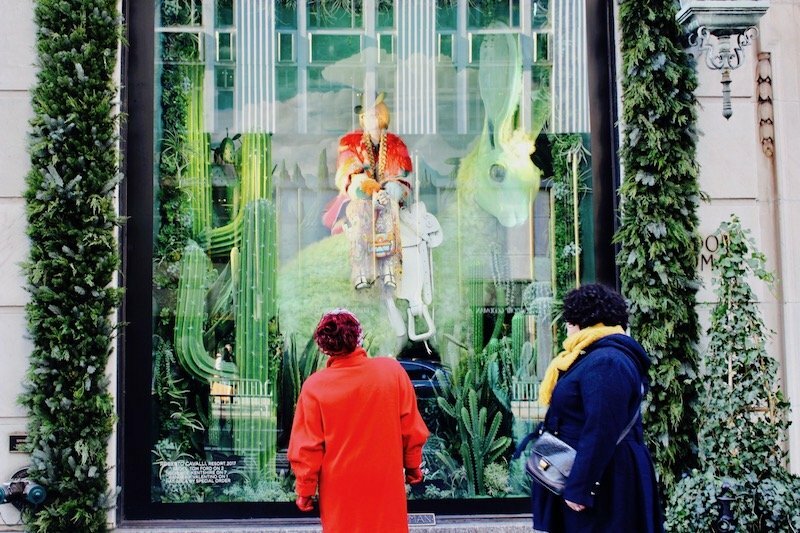 And even if it’s not in your price range, visiting Bergdorf Goodman is an absolute must, simply because of the department store’s incredible window displays. They’re second to none. Just like Fifth Avenue, Madison Avenue is also known for being a designer label lover’s paradise – especially with stores like Prada, Stella McCartney, Christian Louboutin, Dolce & Gabbana, and Agent Provocateur lining the street. But there’s also charming clothing boutiques such as Olive and Bette’s, where you can discover unique brands. You’ll also come across the world-famous Ladurée. A beautifully packaged box of pastel macarons makes for a wonderful (and tasty!) holiday gift. There’s no reason to break the bank during the holidays. Savvy NYC shoppers know how to search for a deal, and where to find designer brands at majorly reduced prices. Century 21 (21 Dey St and 1972 Broadway) is the hallmark of discount designer shopping. And for a bit of department store retail therapy, minus the price tag, head to one of Nordstrom Rack’s several locations around the city. NYC’s specialty shops are famous around the world. For bookworms, it doesn’t get much better than the Strand (828 Broadway) – a landmark bookstore that specializes in rare titles and literature-related gifts. The Strand will also have a kiosk at the Bryant Park Winter Village this season. If you enjoy treasure hunting for a special find, Pearl River Mart (395 Broadway) offers three floors of Asian-inspired fashion, home furnishings, and knickknacks. Many items are one-of-a-kind, and the eclectic setting is the perfect example of the city’s multiculturalism and character. Another quirky shopping favorite is Fishs Eddy (889 Broadway), where you’ll come across a wide range of funky home and kitchen goods at affordable price points. A set of six floral Italian wine glasses is only $52; and, for those coffee drinkers, you can buy a mug that says “The Customer Is Always Wrong” for $17.95. Of course, we’d be remiss if we didn’t mention Dylan’s Candy Shop (33 Union Sq W), because when it doubt, you can’t go wrong with candy as a present! From corporate gifts, to personalized candies, to enormous containers filled with colorful gummies and delectable chocolate, Dylan’s has all the sweet treats anyone could want. Now, for a holiday surprise: FAO Schwarz will be reopening on November 16! After three long years without the iconic toy store, FAO will be making its triumphant return to NYC with a brand new 20,000-square-foot space in Rockefeller Center. Spend a day shopping for all the little ones on your list, reenact Tom Hanks’ Big scene on the floor piano, and enjoy feeling like a kid again. The best part? You can shop each of these specialty stores online! Century 21 photo by Ryan P. via Yelp. Also, the New York shopping guide (not just for holidays). Plus, holiday scenes to get you into the spirit!